Congratulations DLarsen for guessing the Dow's close today within 5 points of the actual close! Your guess of 11,463 was just 1.15 points from the 11,464.15 finish. Hopefully you invested the way you guessed and made some money this week! Overall, however, participants fell well short of the actual close as the average guess of 11,217 was 246 points below the final number. This weekend you'll have an extra day to submit your response so make sure you guess (in the comments section) where you think the Dow will close next Friday by the open on Tuesday. Anyone within +/- 5 points of the actual close will get a free month of our Reminiscences newsletter. We have a winner! With the Dow Jones Industrial Average closing today at 11284.05, we have our first ever winner of the Guess the Dow game. "MogulMan", whose guess of 11281 fell within the accepted range of +/- 5 points, wins a free month of the Birinyi Newsletter Service. Hopefully we'll have even more winners next week. Go ahead and make your guesses now for next Friday's DJIA close price -- just post in the Comments section and provide a valid email address. Good luck! Participants remained slightly bearish again this week as the average response for this Friday's DJIA close was 11,313.40 -- 68 points below last Friday's close. Hopefully someone has guessed within 5 points this week. Good luck and thanks to those who contributed! Well, it's time to see who won our first edition of the Ticker Sense "Guess the Dow" game, in which our readers try to predict where the DJIA will close the following Friday. Anyone who guesses the DJIA's Friday close within +/- 5 points wins a free month's subscription to the Birinyi Reminiscences Newsletter, which also includes weekly update issues and access to the Birinyi Stock Ratings. This week the winner is ... no one. Unfortunately, none of the voters came close to guessing the Dow, although we do give credit to the few who thought it would close higher than 11,300. We thought about expanding the margin of error to +/- 10 points, but we're not going to do that quite yet, because we have faith in you, and we hope to have more participants this week. 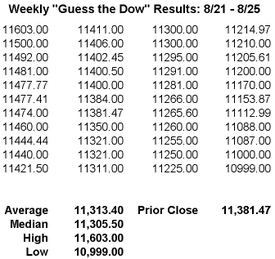 The Dow closed today at 11,381.5, and the closest guess we received was 11,439.01. The average guess was 11,000.88, which means the "wisdom of crowds" must have been out to lunch this time. So here we go: "Guess the Dow", Week 2. If you wish to participate, simply respond to this post in the "Comments" section with your guess for where the Dow will close next Friday, and make sure to provide a valid email address (and please don't vote twice). We aren't doing anything with the emails except using them to contact winners. You have until Monday's open to place your guess. We promise to widen the window of victory if no one wins next week. Good luck, and enjoy "Guess the Dow". We had a pretty good response from readers for our first "Guess the Dow" post. Thank you to everyone who guessed! 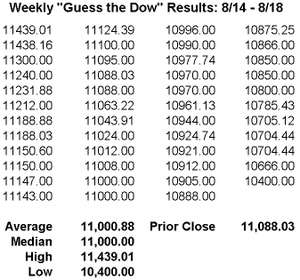 The average of all of the responses for where the Dow would close the week was 11,000.88, indicating a decline of about 88 points. Check back on Friday after the close to see who was closest and to make your guess for next week. In an attempt to create more interactivity with our readers (and collect some more wisdom of crowds data), this week we are starting a new "Guess the Dow" poll. Anyone who wants to play can enter in the comments section of this post what they think the Dow Jones Industrial Average will close at next Friday (a week from today). Guesses will be taken from the market's close on the prior Friday (4pm) to the open on the prior Monday (9:30am). Anyone who gets within five points (plus or minus) of the actual close next Friday will receive a free one-month subscription to our Newsletter Service. Only those with a valid email address will have the ability to win, and if you already subscribe, we'll give you an extra month free. For those that have multiple email addresses, please just vote once! So go ahead and click the comments button below and have at it! We've already made our guess as an example, but we promise we won't hog the glory by guessing it exactly right every time. Good luck! Note: The Dow closed at 11,088.03 this Friday.